Are emerging social media channels right for your brand? Estimated reading time: 3 minutes	Are emerging social media channels right for your brand? Every day there is a new social media channel or update marketers are trying to understand and wrap their heads around. With these constant developments and changes in the digital landscape, we have to constantly ask ourselves, what’s the purpose of these channels and should our brand hop on the bandwagon of early adopters? Now that the top companies have established themselves on the main platforms, such as Facebook, Twitter and Instagram, should they grow their social footprint and test the waters of Snapchat, live streaming apps and others? Here’s a brief breakdown of these trending social platforms and if they are right for your brand. Messaging apps, like Snapchat, WhatsApp and Kik, are becoming more than just platforms for friends to catch up and stay in touch. 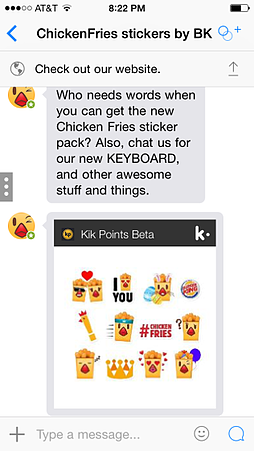 With top brands on Facebook and Twitter seeing only about 2% organic reach, innovative brands, such as Burger King and Taco Bell, are flocking to cutting-edge messaging apps to cozy up to their new target Gen Z and Millennial audiences and create an interactive experience customers will see and engage with. These apps provide real-time, creative and authentic communication between a brand and a consumer. The human-like interaction of direct messages from brand to individual consumers that is seen on growing platforms like Snapchat and Kik represents the most intimate form of marketing so far. Kik users report the highest interest in direct brand engagement (30 percent), followed by Facebook and Snapchat (both 23 percent). While live-streaming apps may seem like something of the future, they are very much real and popular today. But just because celebrities, media and fans are using Periscope and Meerkat, does that mean your brand should be too? Live streaming apps allow users to capture and broadcast video, live, with their smartphones. Here are some of the ways brands are beginning to leverage this new social channel: share live events, host interviews with influencers, provide a behind-the-scenes look into the brand, host Q&A sessions with fans, release new products and conduct product training or provide other forms of advice and education to consumers. Are you using any of these emerging platforms to engage your target audience? Leave your thoughts in the comments.